What is a Credit Advance? Digicel credit Advance is a service that provides prepaid customers with an opportunity to request credit in advance and pay for it later. What can credit advance be used for? Call local Digicel mobile phones, non-Digicel mobile and fixed line and all international numbers. Send text messages to local numbers (Digicel and non-Digicel), and international numbers. 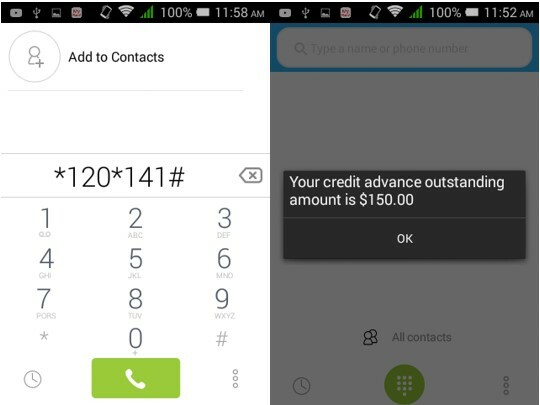 How Do I Qualify To Use Digicel Credit Advance? Any prepaid subscriber is qualified to use the service. How Do I Use The Digicel Credit Advance Service? Customers can use this service by dialing *141# and following the instructions received. Is There Any Service Charge On My Credit Advance? There is a fee that will be deducted on repayment of the CREDIT ADVANCE. Please see break down below. How Can I Check My Credit Advance Balance? Do I Need To Have Credit In My Phone To Qualify For A Credit Advance? No, a credit ADVANCE can be taken at any time. However, there are restrictions on the amount of credit advance that you can apply for. The amount you are entitled to will be displayed after dialing *141#. How Many Times Can I Request A Credit Advance? You may request an advance as many times as you wish, AFTER repaying any advances previously taken. In other words you must repay any outstanding advance before you can request a 2nd Credit Advance. Is There An Expiry Date On The Credit Advance Requested? No. The credit received from the Credit Advance request will not expire and will remain on the account until it has been used. Can I Use This Service While Roaming? Yes. Customers will be able to request a credit advance when roaming. Are There Any Restrictions For The Use Of The Credit Received From A Credit Advance Request? No. Credit received from a credit advance can be used for all network services, such as calls, SMS, Credit U and plan activations. What Happens If I Repay My Credit Advance Before Exhausting The Credit Received From My Credit Advance Requested? Credit received from the Credit Advance will be available until it is used. What Is The Rate For Calls When Using The Credit Advance Credit? Rates charged from the credit advance balance will be the same as the prepaid rates. Click here to see our Prepaid Rates.